The first phone designed entirely by Google looks uninspired, but the software inside is powerful as hell. Of the tens of thousands of Android devices to choose from, I have always preferred the Nexus phones, which were made by Google and a rotating cast of partners like Samsung, Huawei, and LG. Nexus devices ran Android the way Google intended, without third-party “skins” and other feature gimmicks that afflict so many other brands that take advantage of Android’s free, open-source platform. This year, Google broke free of its Nexus partnerships, opting instead to strike out on its own. While they are built in HTC’s factories, the Pixel and Pixel XL are the first phones designed entirely by Google. They hit shelves on Oct. 20 around the world. After spending four-ish days poking, prodding, and reviewing the Pixel, it’s clear Apple, Nexus, and Samsung’s flagship phones heavily influenced it. And that’s not a bad thing. If you’re looking at display, processor, battery, and camera specs alone, the Pixel is fairly average when compared with the most premium devices. But maybe that’s the point. Google doesn’t need to be the best. With its new phone, Google proves that it can (mostly) keep up with big players like Samsung and Apple – and offer customers something only Google can offer: exclusive, killer features built for the online services that they already use, and direct access to an artificially intelligent personal assistant powered by the company’s massive knowledge graph. Its hardware is nothing spectacular. But I found the Pixel to be the most pleasant, playful, and user-friendly Android device I’ve ever used. It’s an impressive first effort by Google as the architect of the Android platform and its vessel. Setup is less painful with a little help from Google. The Pixel comes with a handy “quick switch adapter” accessory that helps users sync data from their old iPhone or Android device. I transferred text messages (even the iMessage ones), music, podcasts, photos, and videos in under 10 minutes from my iPhone 7 to the Pixel. Because I use a Google account for most things anyway (email, calendar, reminders, etc. ), the transition was fairly seamless. When I opened Google Maps, my starred locations were already there. My apps, however, most of which have Android versions, didn’t make it onto the new Pixel, which was deeply annoying. I had to manually search for and install 30-ish apps, which, I already know, is way too many. At first, switching from an Android device to the Pixel XL was a little tricky. Since both the Nexus 6P and Pixel have USB-C ports, the order in which they were plugged in was important. I also needed to use the USB-A to USB-C cable with the adapter, instead of the USB-C to USB-C cable. Eventually the issue sorted itself out, and the data transfer was quick and easy. Unlike with the iPhone, the Pixel automatically downloaded my purchased apps and even logged me into apps like Strava. There’s a support team built right into the phone. Google is responsible for all aspects of the Pixel, which is especially good for customers if and when something goes wrong. “It’s not like there’s any confusion about whether I go to HTC, or do go I to Google,” Dave Burke, VP of engineering for Android, told BuzzFeed News. “Google is taking care of the customer, and we’re just much closer to our users now,” the nine-year Google veteran said. Every Pixel owner gets free support 24 hours a day, seven days a week, right from the phone’s settings app. It’s an introvert’s dream. 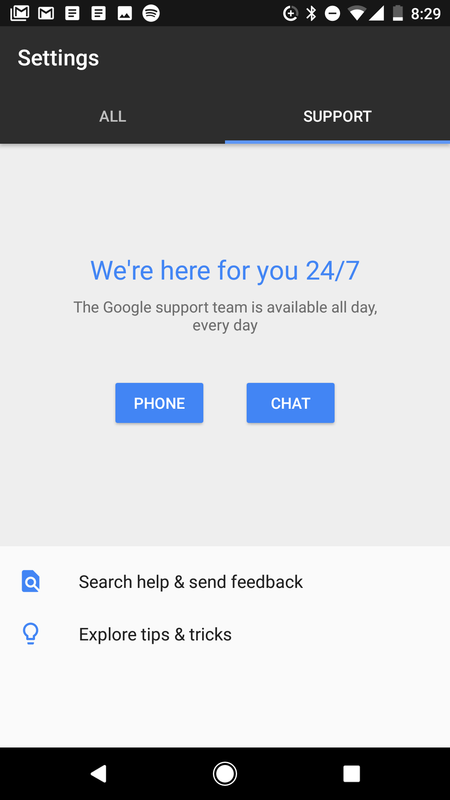 Instead of waiting in line at a store, you can just press chat, type in a short summary of the problem, and chat with (or, call, if you prefer) a Google support rep at your convenience. I had a quick one-on-one with Sean, who said he's based in Northern California. He told me that, no, I can’t migrate apps from an iPhone (at least not yet). 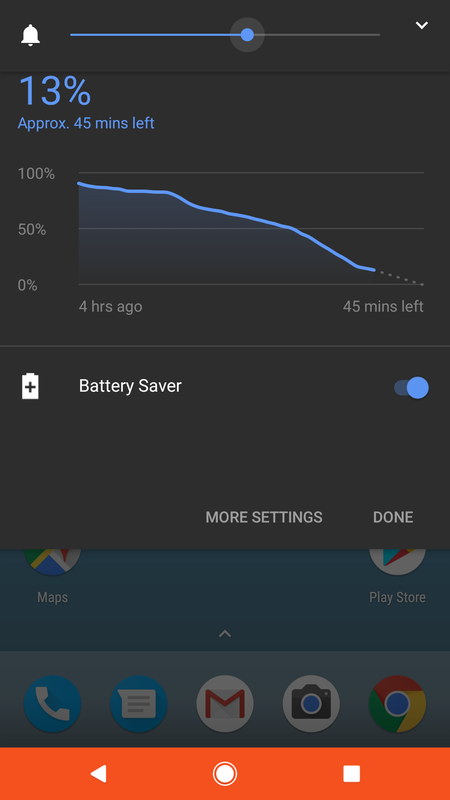 When I mentioned I'd been burning through the Pixel’s battery like crazy, I asked him for tips and he promptly emailed me a comprehensive guide along with a handy video on how to make your battery last. The email also had a reference number in case the tips didn’t work and I needed to contact the support team again. There's a new screen-share option that lets support staff walk users through a solution, step-by-step, on their phone screen but only, of course, if they choose to share it (because otherwise that would be creepy). It’s hard to tell if the feature will be plagued by long waits or slow response times in the future. But if it’s anything like the customer support on Project Fi, Google’s cellular service that also has built-in chat and phone support, it’ll be infinitely more pleasant than most support experiences. The Pixel is the first to run Android 7.1 and, at least for now, the only to have the Pixel Launcher. The polished Pixel Launcher, the interface’s slick animations, and the snappy processor underneath the hood make using the Pixel the most pleasant Android software experience I’ve ever had. I was genuinely impressed. If you’re going to get this phone, get it for its software, not its hardware (which, as I’ll explain later, leaves something to be desired). Google has typically premiered the latest update of its Android mobile operating system on a Nexus phone. But this year, that privilege went to the LG V20, the first device to run Android 7.0 Nougat. And now we know why. The Pixel comes with the even more fresh Android 7.1, which features some nifty new capabilities. * You can swipe down on the fingerprint sensor to view the notification pane. It’s a great way to quickly access your incoming notifications with one hand. * App shortcuts (which on iOS are known as 3D Touch Quick Actions) allow developers to implement shortcuts that appear when a user presses and holds an icon from the homescreen. 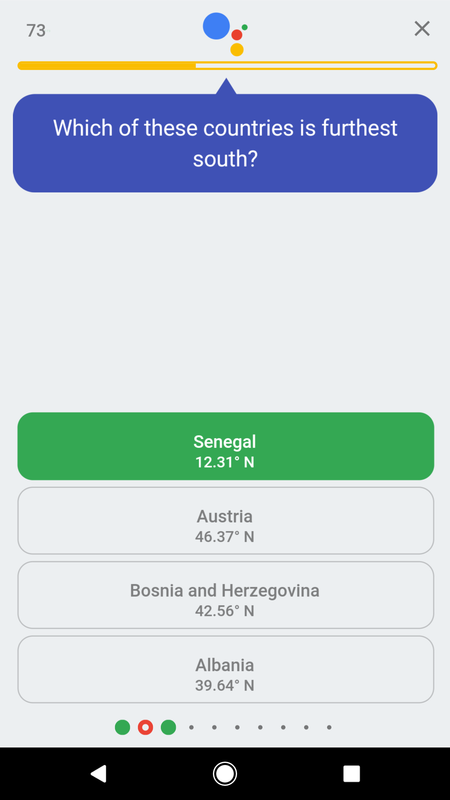 It’s already available in apps like Google Maps, Chrome, and Gmail. * The new Night Light setting reduces the blue light emitting from your screen when the sun goes down. Blue light allegedly inhibits your ability to sleep by preventing your body’s production of melatonin, a hormone that makes you feel sleepy. * Instead of waiting 10 minutes for your phone to download an updated OS, the Pixel downloads it in the background, and you don't see the change until you reboot. * New emojis that portray women in the same professions as men are available in the emoji keyboard. You can send a female mechanic, scientist, farmer, chef, and more, in multiple skin tones. Older Nexus phones should be able to update to Android 7.1 soon. But there are more significant updates that are exclusive to the Pixel. The Pixel is the first and only phone with Google Assistant, a powerful new artificially intelligent bot. It’s a re-imagination of what longtime Android users know as “OK Google” or “Google Now.” Users can talk to Google Assistant through chat or voice. It’s more conversational than Google Now, and Google Assistant can learn things about you, like your birthday, favorite color, or favorite kind of dog. 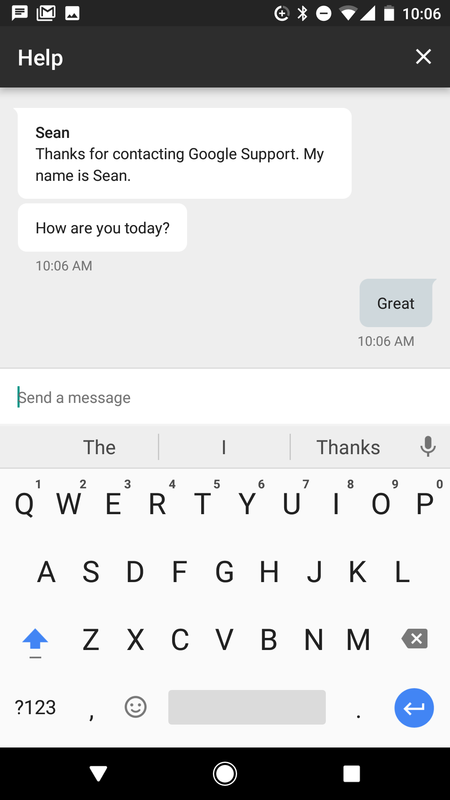 The chat interface is available for both iOS and Android in Allo, Google’s new chat app. 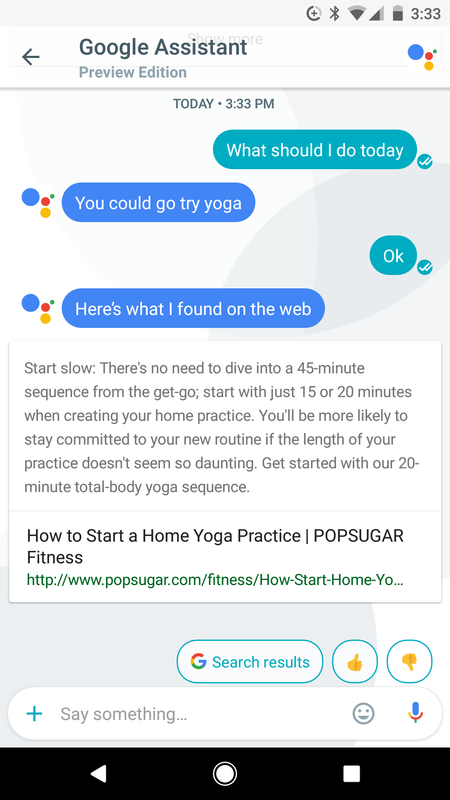 But the always-listening, voice-activated version of Google Assistant is available only on the Pixel. You can ask Google Assistant to play games, make a reservation at an OpenTable restaurant, look up a movie’s reviews, set reminders, and find directions. By understanding pronouns like “he,” “she,” and “it,” Google Assistant is far more contextual than Apple’s Siri, Microsoft’s Cortana, or Amazon’s Alexa. But, unlike Siri and Cortana, it can’t show you emails from a contact or read your text messages yet – and, like the other AI assistants, when your internet is slow, so is its response time, even if it’s performing a task that doesn’t require a connection, like setting a timer. Another Pixel exclusive is the new Pixel Launcher. You can now swipe up to see a “drawer” of all of your apps from the homescreen, which is a “duh” feature that I can’t believe all phones don’t have. Smart Storage, a feature that’s also just for the Pixel, automatically removes old photos and videos on the device that have already been backed up to Google Photos. Pixel users receive free, unlimited Google Photos storage at full resolution for photos and videos (non-Pixel users are limited to 16MP images, and anything larger than that eats into your overall 15GB Google storage limit, unless you pay for more). The Pixel has a processor that’s finally powerful enough to make Google’s animation-heavy Android OS actually look great. The whole software experience is fast and sleek, and that may be because the phone I’m using is brand new, or because of the 2.15Ghz + 1.6Ghz, 64-bit, quad-core Snapdragon 821 processor housed inside. According to a Geekbench performance test, the Pixel had a fairly average score: a single-core score of 1,596 and a multi-core score of 4,114. The Pixel XL review unit, which has the same processor, got a 1,679 single-core and a 3,966 multi-core score. Both sets of scores were much better than the Nexus 6P’s (1,274 and 2,704, respectively). The Galaxy S7, which has the previous generation Snapdragon 820, has the best score, with an average of 1,806 for single and 5,228 for multi-core, according to the app. It’s important to keep in mind that CPU benchmark tests don't perfectly represent the device’s real-world performance, especially with phones like Samsung's that are loaded with “bloatware” or extra features that run on top of Android and slow the devices down. 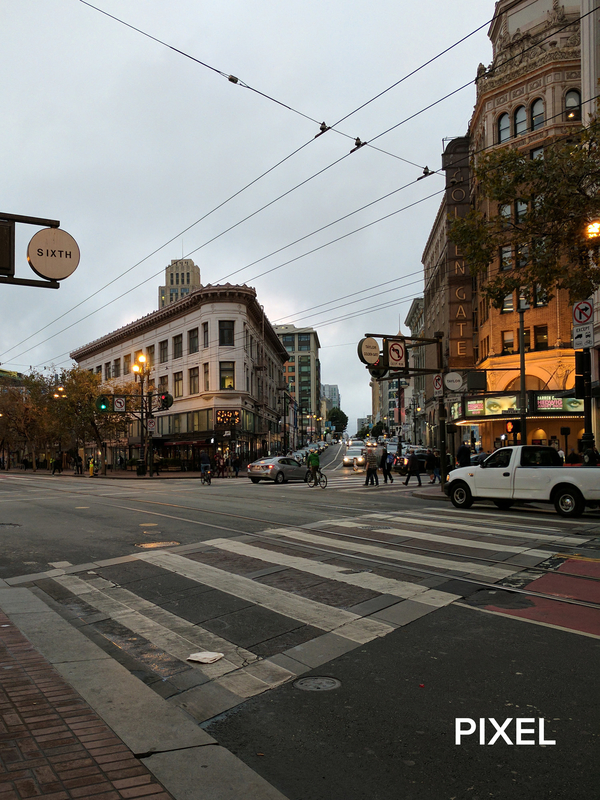 Google talked a big game about having a fantastic camera, so let’s dive into that first: There's a fairly substantial camera improvement between last year's Nexus 6P and Google Pixel. The 6P has the same "1.55 micron"-sized pixels and f/2.0 aperture as the Pixel, but the Pixel does a much better job of understanding the scene's white balance, or the temperature of the light source. While the 6P excels at capturing low-light, nighttime images (like of this carnival), its images tend to appear overly warm, which makes skin look more red and natural light look more purple. The Pixel consistently produced better images than the Galaxy S7 Edge, too. The Pixel image is brighter and more balanced, while the highlights in the Galaxy S7 Edge's photo are slightly overexposed. 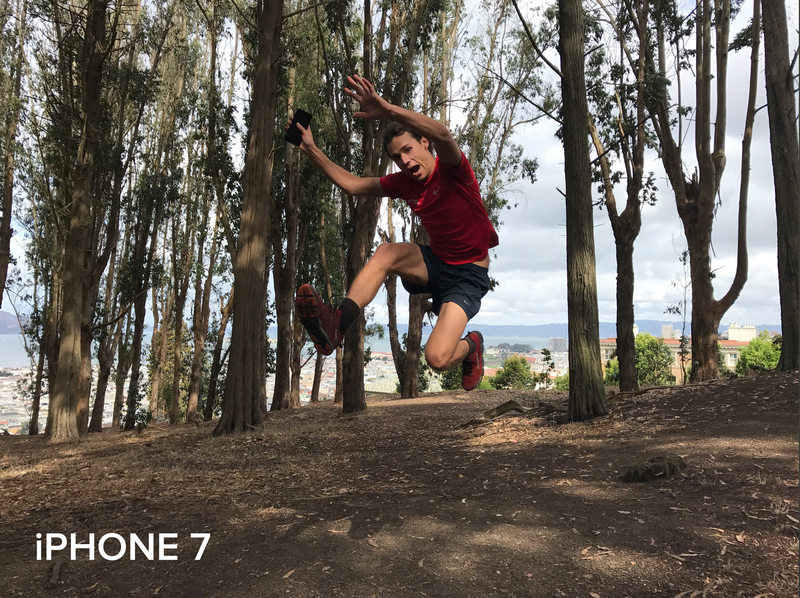 It's more fair, I think, to pit the Pixel against the best camera phone on the market right now: the iPhone 7. There is a lot of technical hardware nitty gritty one can use to compare the two cameras. The iPhone's aperture (or the size of the hole inside a lens that allows light to come in) is larger, at f/1.8, than the Pixel's, which is f/2.0. The Pixel has a 12.3-megapixel camera, while the iPhone's is just 12 megapixels. But comparing those numbers isn't an accurate measure of a camera's image quality. Sensor size, number of pixels, and a number of other specs are relative to each other (for example, more MP with the same sensor size means more noise) – and phone makers will often highlight the numbers that make their camera seem better than their competitors. 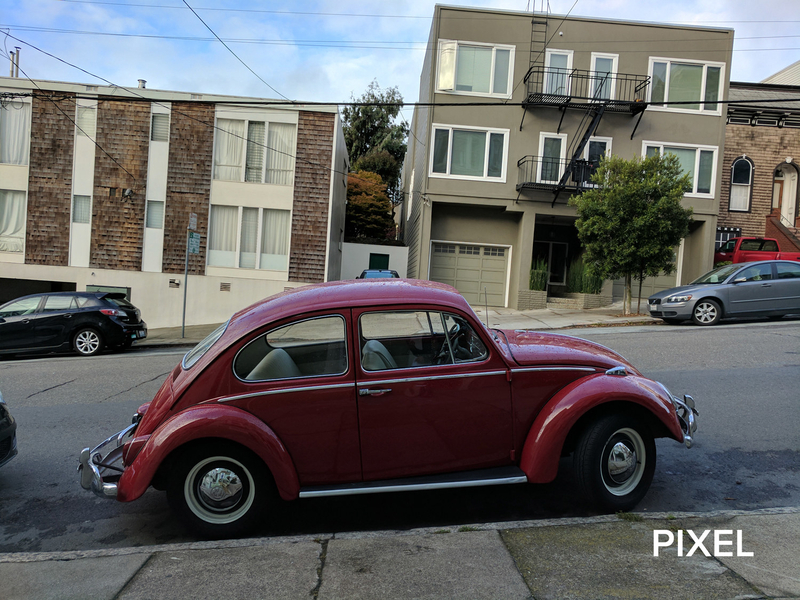 The key to a great smartphone image is the digital post-processing that happens after it's captured, and the only way to understand how the Pixel's software treats photos is to compare them, side by side, with unedited iPhone photos. The iPhone 7 image is brighter overall, but both the Pixel and iPhone capture details well in low light. Click on the images to see them up close. 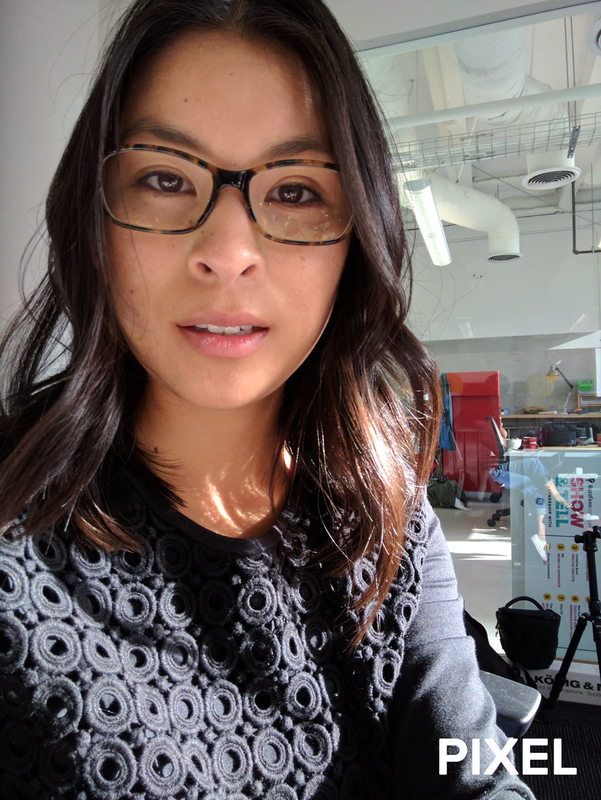 In direct sunlight, the Pixel's images look warmer and more saturated. The front-facing cameras are pretty much the same. ...except in situations where the subject is moving, the foreground is dark, and the background is light. 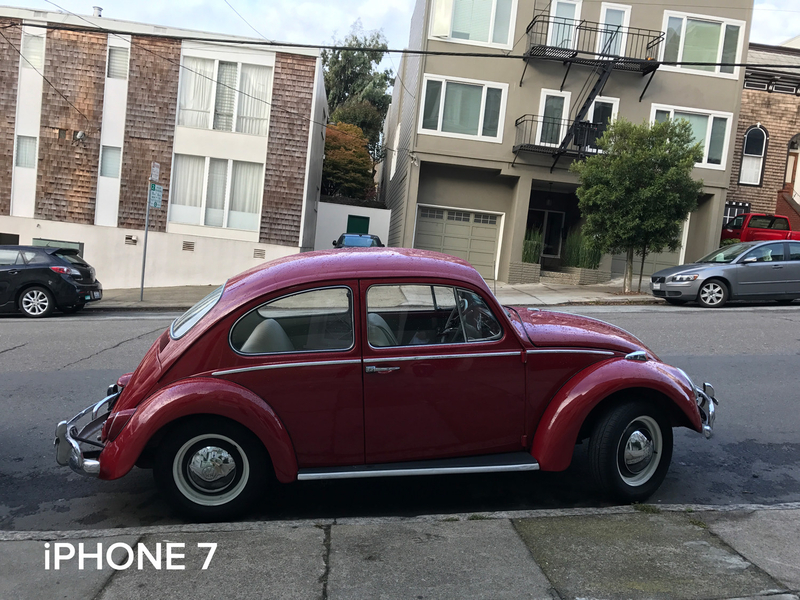 Here, the iPhone 7 significantly outperforms the Pixel. The Pixel, however, is better at capturing the skin's natural texture (though not its color). 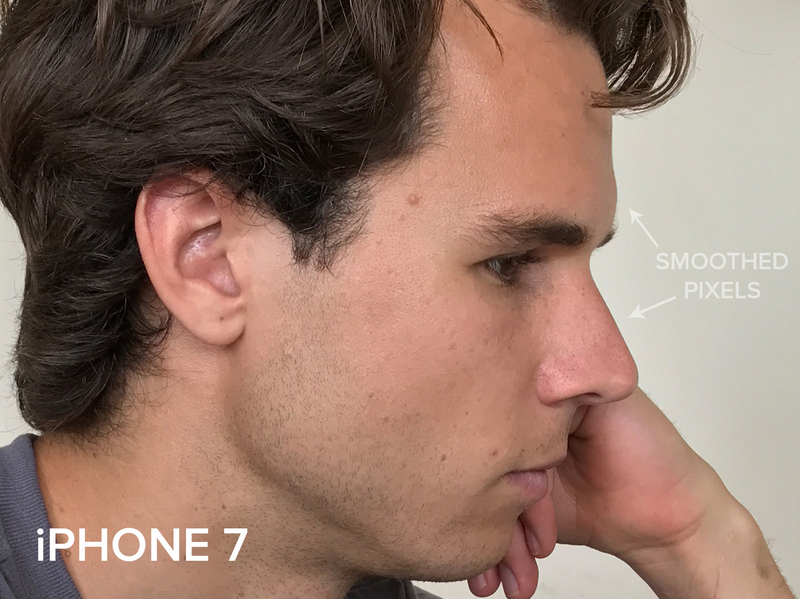 There's a strange smoothing effect in photos of faces taken by the iPhone 7. If you hate your pores, maybe this is a good thing. 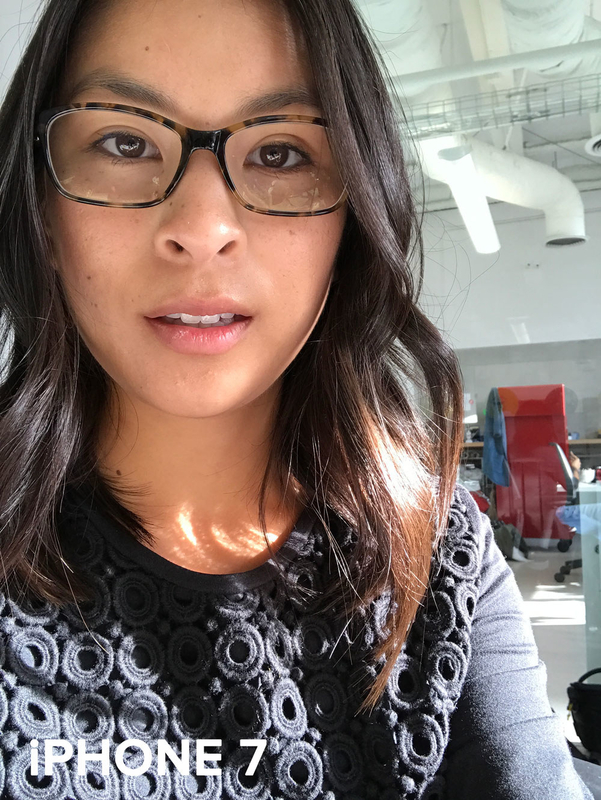 If you want your photos to represent what people actually look like IRL, it may not be. 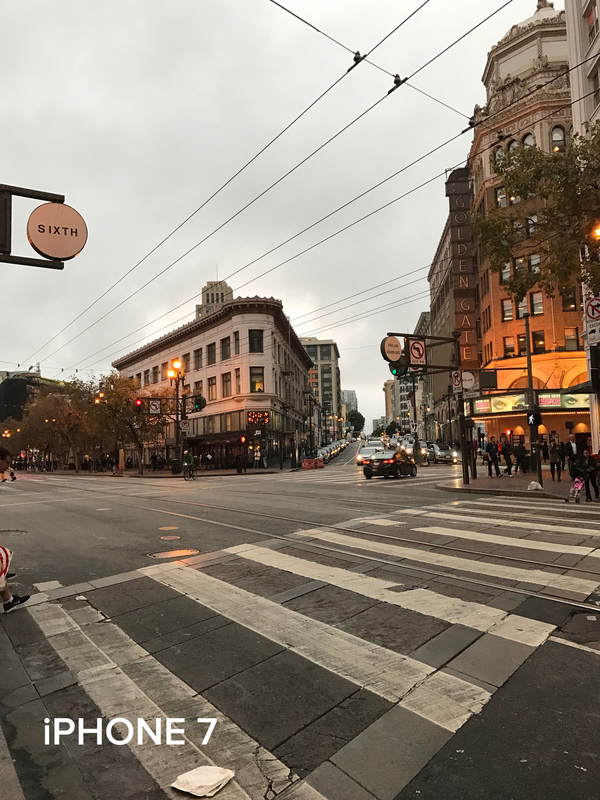 In the end, I'd still choose the iPhone 7's camera over the Pixel's, but it's a pretty close fight. The Pixel's camera is pretty comparable to the iPhone 7 and definitely better than any Android camera on the market. The battery was very inconsistent. On its second day, the smaller Pixel ran hot when performing tasks like playing videos on Facebook or loading an article. I got about eight hours of battery before the phone shut down. Google claims the phone has a 13-hour battery life with continuous Wi-Fi use. I thought it may have been an isolated incident, since I was still performing a lot of setup and downloading apps, which is rough on a battery. But on the second day, I got only five hours of battery; a peek at the settings page said that the Google Photos app is to blame. Thinking that I might have a defective review unit, I reached out to Google about my battery issues. A PR rep wouldn’t specify what the problem is, but said the team is working on a fix. I barely touched my phone on the third day and got a more normal result. It’s at 30% after 12 hours, and the settings page says there’s still five hours left. The larger Pixel XL fared much better. It didn’t run warm at all and met Google’s advertised battery expectations. This phone’s hardware isn’t physically extraordinary, but it’s much easier to hold than last year’s phablet. There are two phones, a smaller 5-inch model called the Pixel and a larger 5.5-inch model called the Pixel XL, available in Quite Black, Very Silver, and, if you’re in the US, Really Blue (which is already sold out). The Nexus 5X and the Nexus 6P are only slightly larger, at 5.2 and 5.7 inches respectively, but that extra height makes a big difference when you’re trying to sit down with a phone in your pocket. There’s something more grabbable about the Pixels, especially the larger XL version. The Nexus 6P was very tall for a phone, and tended to tip over when it was held. 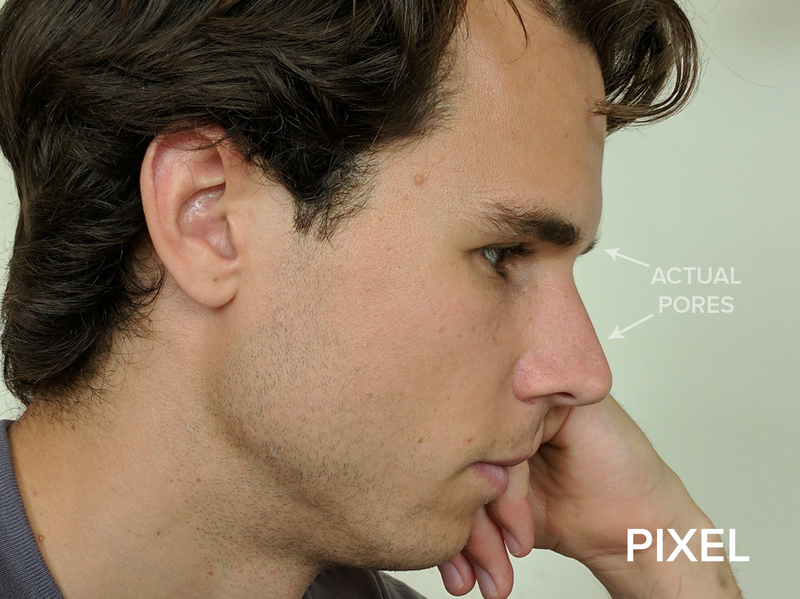 The Pixel’s center of gravity is much closer to your palm. It’s marginally thicker as well, which is actually a good thing. The Nexus 6P’s edges are so sharp that they dig into the fat of your palm, constantly triggering an accidental touch at the screen's edges. On the Pixel, there’s a nice place for your fingers and palm fat to rest: a tiny flat ledge running along the edge of the phone. One thing that’s pretty wild is how, on both Pixels, the top is slightly thicker than the bottom to account for the camera. Google was insistent that there be no camera bump, so instead the phones got a subtle slope. Since I have smaller paws and prefer operating phones one-handed, I’d personally opt for the smaller and cheaper of the Pixels. But if you want something that borderlines on tablet/e-reader territory, get the XL. The “Quite Black” model is clearly the best of the three color options. It’s in line with the Darth Vader aesthetic of previous Nexuses and the glass panel on the back is more subtle. The photo here doesn't do it justice. The panel is more of a warm gray. The “Very Silver” color doesn’t resonate with me as much. The Galaxy S7 Edge, with its curved screen and glassy back panel, could easily be a prop in Minority Report or Blade. The silver/white Pixel, on the other hand, *might* get screentime in a movie set in 2014. From certain angles, the “Very Silver” Pixel’s resemblance to the iPhone 6 (here, on top, with the Pixel on the bottom) is uncanny, right down to the antenna lines. Its white accents are warm and inviting, like a minimalist living room in a CB2 catalog, but cheapen the overall premium experience somehow. One feature that stands out (in maybe a bad way) is the “Very Silver” model’s white glass “shade” covering both the main camera and fingerprint sensor, which are both on the back of the phone. I once saw a photo of a fashion week-y person with a structured white blazer draped precariously over her shoulders, like a cape, while the blazer’s empty arm holes flailed about, and I thought to myself, Hmm, interesting but honestly what is the point. That’s how I feel about the shade. TL;DR: Get Quite Black. Where the Pixel falls short. Flagship phones typically add something new to the conversation – and it doesn’t feel like the Pixel’s design has anything to say. This year, Samsung showed us what an elegant curved display looks like and Apple gave us a high-gloss jet black finish that disappears into the phone’s screen. Google’s phone, especially in Very Silver, feels dated in comparison. Google took from its influences (the iPhone 6S, last year’s Huawei 6P) and created a phone with decent, but uninspired, hardware. But what’s inside of that pedestrian packaging – a solid camera and a beautifully designed, thoughtful operating system – is quite powerful. The 32 GB version starts at $649 for the Pixel and $769 for the Pixel XL. That’s as expensive as the iPhone 7 or Samsung Galaxy S7/S7 Edge, which both offer an important feature that the Pixel doesn’t: water resistance. Additionally, the Samsung devices have expandable storage through a micro SD slot, and Apple offers an (incredibly expensive) 256 GB iPhone tier. The Pixel has unlimited photo/video storage, but the phone itself is capped at 128 GB, which may not be enough for some power users. The iPhone also tends to beat Android devices in real-world speed tests. The iPhone 7 scored 1,703 points higher than the Pixel on Geekbench’s single-core test and 1,218 points higher on the multi-core test. Between my iPhone and the Pixel, there isn’t a huge difference in speed. But only time will tell if its performance will remain consistent with daily use. Stray observation: The side buttons are very sticky and the click is very loud. It drove me NUTS. 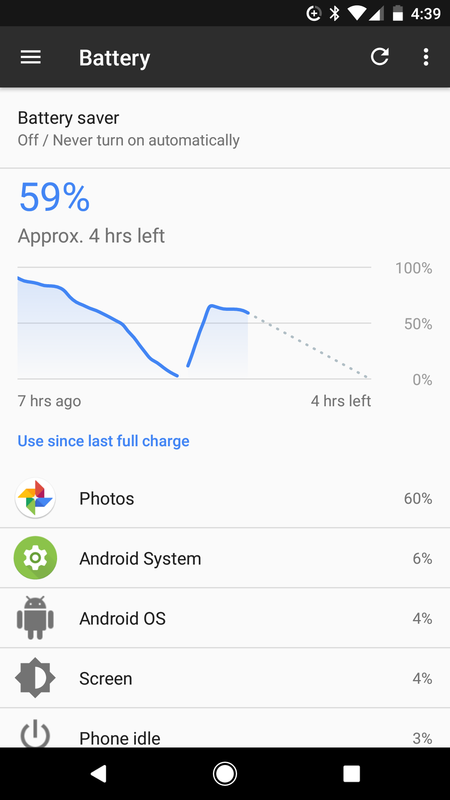 The battery issue on my smaller Pixel unit seems to be due to constantly auto-uploading images to Google Photos, which is wonderful in theory but a huge drain on the phone's power. Curious to see how Google plans to fix it. So, should you get the new Pixel? The improvements in Android 7.1, plus the exclusive Pixel Launcher and Google Assistant features, make the Pixel worth upgrading for if you have a Nexus 6P or older. The camera is significantly better than previous Nexus devices, and you’ll feel a big difference with the processor upgrade. It’ll be harder to walk away from a Galaxy S7 or S7 Edge. Both of those phones are highly performant — and water-resistant, which the Pixel isn’t. Since micro SD cards are cheap and the Galaxy S7 phones have expandable memory, the unlimited photo and video storage included with the Pixel isn’t as much of an added benefit. Plus, if you’re a very patient Samsung user, you too will get the Android 7.1 update, eventually. 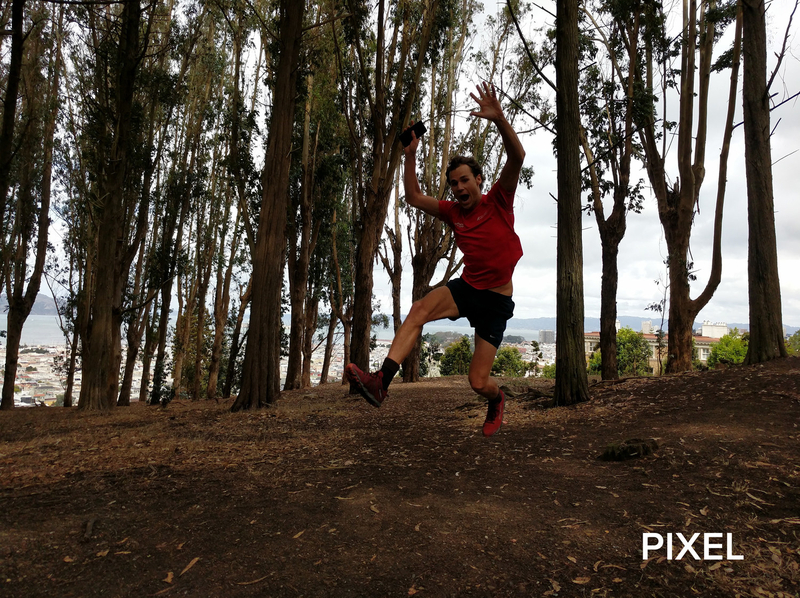 If you have an older Android phone, like a Moto X or even a Galaxy S5, the Pixel will feel like a big step up, especially with its camera quality and OS improvements. This is the “Nexus” you’ve been waiting for. If you’re an iPhone user, unlimited storage in Google Photos is a huge plus — something that could even sway iOS diehards. If you’re coming from an iPhone 6S or older, and not interested in a headphone jack-less or water-resistant device, the Pixel is definitely a device to consider. If you do switch from iOS, you’re going to love how much better Android handles notifications and being able to choose your preferred app as default. Plus, the included quick-switch adapter makes the transition easy. The Pixel is just as premium as any of the other flagship phones you’ll find on the market. It has comparable screen resolution, processing capabilities, and camera technology. But it’s not better in any of these regards. Its software is its real killer feature. The Pixel and Pixel XL go on sale on Oct. 20, but are available for pre-order now through the Google Store, Verizon, Best Buy, and Project Fi.